I recently had the opportunity to test two products from L'Oreal's RevitaLift Miracle line - the Eye and Skin Smoothers. These products are designed to blur the appearance of fine lines, pores, puffiness, dark circles, and wrinkles. The products bridge the line between treatment and makeup. Let's have a look! L'Oreal RevitaLift Miracle Blur Eye Treatment alleviates the harshness of lines, dark circles, and puffiness with a matte-effect, light beige tint, and slight shimmer. Revitalift Miracle Blur Instant Eye Smoother is the first anti-aging eye treatment with Opti-Blur Technology and light-diffusing pigments to instantly reduce signs of aging and fatigue around the eyes and create a younger, radiant finish. Erase the look of Crow's Feet, Dark Circles, and Puffiness. The product comes in a long squeeze tube with an angled tip. You can either apply it directly to skin or on your finger tips to rub in. The product is fragrance-free, silky, and lightly tinted beige with faint shimmer. Once rubbed in it instantly turns matte and give an air-brushed effect. How did it do? As far as blurring and softening lines, it was a champ! This is a silicone-heavy product, however, so the effect was primarily an optical one. It did not seem strongly moisturizing, though it was not drying. I did experience a slight increase in breakouts when I used it on my whole face, as I am sensitive to silicone, and that is the primary ingredient. If you are not sensitive to that ingredient and are looking for something to brighten your face on makeup-free days, this would work well for you. It is priced at $24.99 for .5 fl oz. 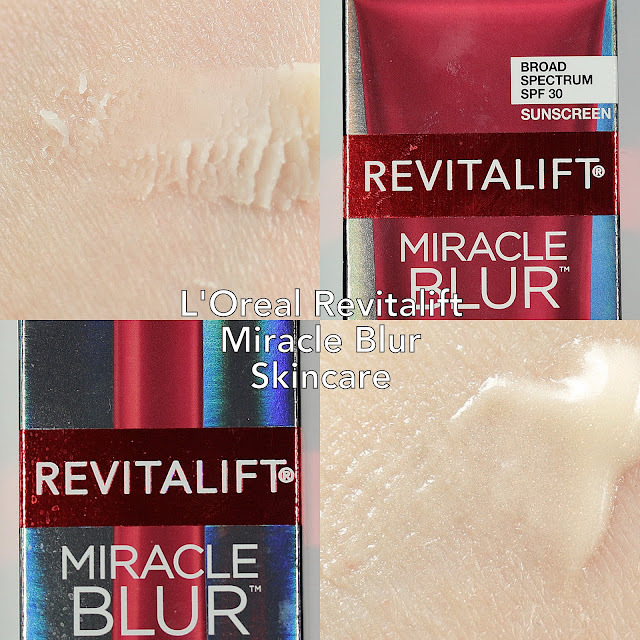 The L'Oreal RevitaLift Miracle Blur Instant Skin Smoother is a similar product, designed for full face use. It also provides the additional protection of a sunscreen with SPF 30, but if you plan to be in the sun more than a few minutes you may want to also use a regular sunscreen. The product comes in the same type of plastic squeeze container as many drugstore foundations. It has a flip top with a slight nozzle. The Skin Smoother has no fragrance but a slight sunscreen smell. I would say it is actually more of a paste than a cream and tends to ball up as it comes out. It is a bit of a challenge to get out of the tube - you have to squeeze hard. One rubbed in, it looks very smooth, but you need a thin layer. How does it do? Again, for blurring and softening, it is highly effective. It is not really very moisturizing and I would consider it more of a primer-type product, for which it performs well. I wore it on its own and under foundation and it worked both ways. Since it is heavy in silicone, it did cause a slight increase in spots for me, but if you are not sensitive to that ingredient it probably won't cause a reaction. I was a bit surprised at how hard and dry it felt - I wish it had a bit more viscosity to make it easier to get out of the container and spread on the face. It is priced at $24.99 for 1.18 fl. oz. Overall, I would say due to my silicone sensitivity, these products weren't for me, but they definitely satisfied the claims made by the manufacturer - optical blurring of fine lines, wrinkles, and puffiness. My face had an air-brushed, soft look to it after application and the products definitely gave my face a more finished look even without foundation. These products can be purchased online or at drugstore or mass merchants that carry L'Oreal. 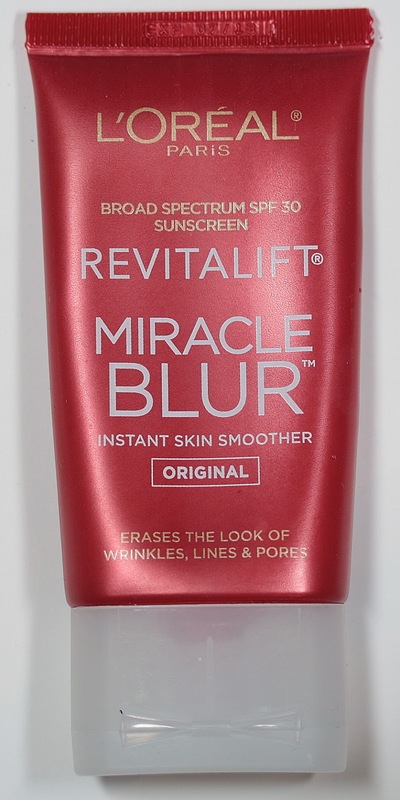 Have you tried any of the RevitaLift Miracle Blur line? What did you think?